First Glasgow has launched 10 new Enviro400 City double-deckers, built by Alexander Dennis Limited (ADL) for its 500 service which entered operation 14 April. The 500 service, which runs from Glasgow City Centre to the Airport every 15 minutes, carries over 1.9 million passengers a year. The new vehicles come equipped with 4G WiFi, USB charging points, and wireless charging facilities on both the tables and seatbacks. In addition to these features, the vehicles are also fitted with SmartVision mirrorless systems. 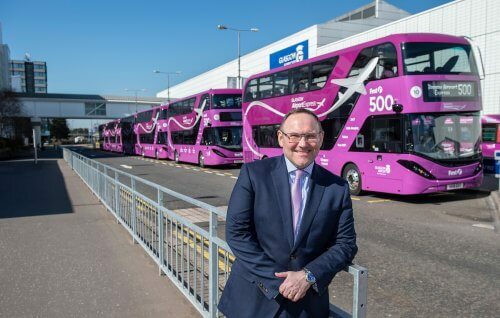 Marie Connell, Business Development Manager at ADL, stated: “I supported the launch of the initial Enviro200 fleet on the Glasgow Airport Express route in 2015 and am delighted that we are taking our collaboration with First Glasgow on this popular route to a whole new level with these 10 new Enviro400s. “First Glasgow gave us challenging brief – low emission double-decks, which meet the weight restrictions demanded of LEB compliant vehicles without compromising on passenger comfort. The premium interior specification of these low emission Enviro400s ensures that all passengers will enjoy a first-class passenger experience travelling to and from the airport. “The operator has now invested over £30m in a total of 150 new ultra-low emission vehicles for Glasgow since October 2018. Andrew Jarvis, Managing Director for First Glasgow, said: “It is exciting times for everyone at First Glasgow in being able to share these vehicles with the people of Glasgow and the rest of the world via our friends at Glasgow Airport. We have a great working relationship with the airport team and with these new state-of-the-art vehicles; we are providing their customers with a first-class experience on their journeys to and from the airport. “This investment marks the end of our second phase of new bus launches linked with the Glasgow Low Emissions Zone (LEZ) and takes us a long way toward compliance for phase 2.